It’s easy to be an optimist on Opening Day. Coors Field will be filled with fans cheering loudly for the home team. 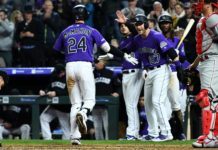 As the season unfolds, a good portion of that optimism will vanish unless the unexpected happens and the Colorado Rockies become legitimate playoff contenders in the difficult National League West. For the glass half full crowd, taking two of three on the road from the Arizona Diamondbacks to open the season was a great sign. Young shortstop Trevor Story did something that’s never been done before, hitting four homers in his first three games in the big leagues. The Rox had plenty of offense, blasting 10 home runs and scoring 20 times in three games. This team will score runs – at home and on the road. They just have to find a way to patch together reasonable starting pitching until the highly touted pitching prospects “arrive.” So far, those results are mixed. For the glass half empty crowd, No. 1 starter Jorge De La Rosa didn’t look much like an ace on Opening Night. His velocity was down and his command was spotty, the result being an outing too short to pick up the win when his team spotted him a 7-1 lead. Game 2 starter Chad Bettis also failed to impress, yielding five runs in less than six innings. As a duo, their collective ERA sits at 9.00. For the Rockies to outperform expectations, those two have to pitch more like front-of-the-rotation guys who can go deep into games, protect big leads, and save the bullpen. Surprisingly, No. 3 starter Tyler Chatwood, coming off his second Tommy John elbow surgery and having missed just shy of two full seasons, was the best of the group thus far, giving the Rockies their only quality start (6.1 innings, two runs) in the series and picking up the victory. The new Chatwood wasn’t throwing as hard as he has in the past – perhaps by design – but was more efficient and effective than past versions. The five-foot-something right-hander must try to pitch a little more like Greg Maddux and less like Nolan Ryan if he’s going to make it through the rigors of a full season without getting hurt again. Early returns are encouraging. Friday’s home opener will feature another oft-injured starting pitcher, Jordan Lyles, who will try to match the outing of Chatwood and give Rockies fans reasons to be optimistic about the patchwork rotation. Lyles is coming off two shortened seasons that featured quirky injuries, first a broken hand that ended his 2014 season, and then a Tommy John surgery in his big toe that sidelined him last year. Combined, he’s made just 32 starts over the two seasons. He’s been decent when he’s been healthy, so there’s reason to be hopeful. For now, when the Rox need a fifth starter, it will be long man Christian Bergman getting the ball. He was not very good in a relief stint in Arizona, although that remains his best role. Looking ahead, this rotation desperately needs a healthy and focused Jon Gray to step up and lead the staff while young prospects like Jeff Hoffman and Kyle Freeland continue to develop. As this season progresses, Rockies fans should keep one eye on these youngsters and hope that when the time comes for them to join the big league team, they are healthy and prepared. But success should not be measured in 2016 by whether or not this becomes a playoff team. 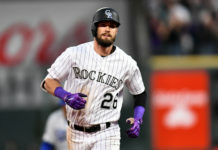 Rather, the season should be viewed as a success – regardless of the final win total – if by mid-September the glass half empty crowd can be excited about a starting rotation that includes Gray, Hoffman and an improved Eddie Butler, plus a solid bullpen that includes a reinvented Chatwood, with hot prospects like Freeland knocking at the door. Even for the glass half full crowd, being honest, the NL West appears too loaded with experienced and talented clubs for the Rockies to stay in the pennant race all year. Stranger things have happened, though. It’s Opening Day. Why not be optimistic?